Allergies are a common cause of illness and can occur at any stage in someone’s life. Numerous different things cause allergies from pollen to food to medication, meaning it is not always easy to know the best treatments or home remedies. Many people have allergies, which may cause symptoms such as coughing and sneezing. An allergic reaction occurs when cells in the immune system interpret a foreign substance or allergen as harmful. 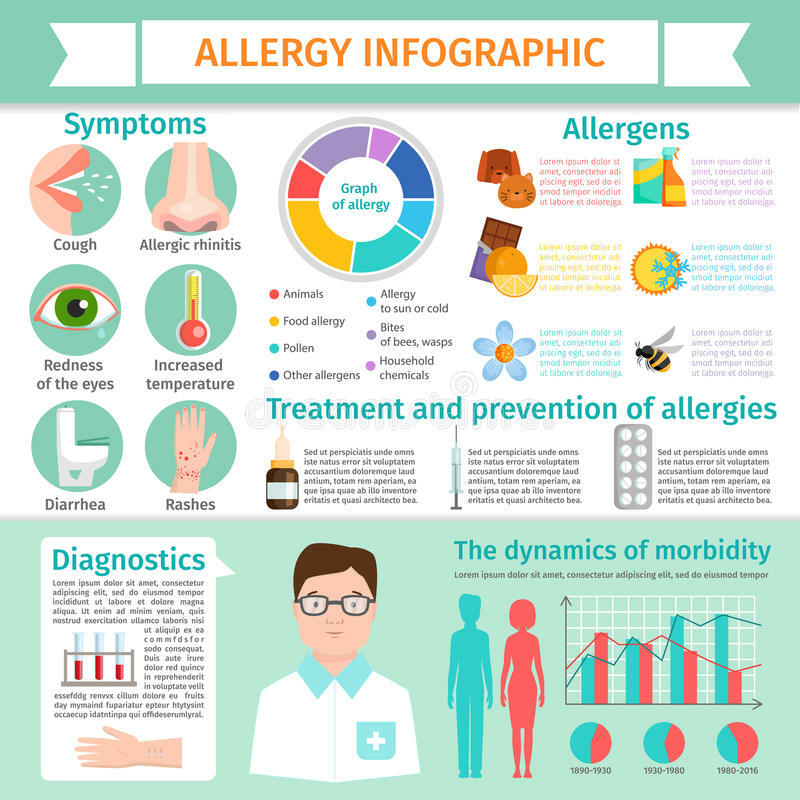 The immune system overreacts to these allergens and produces histamine, which is a chemical that causes allergy symptoms, such as inflammation, sneezing, and coughing. Most minor allergy symptoms can be treated with antihistamines, corticosteroids, or decongestants. Saline nasal rinses can be used for congestion-related allergy symptoms. Corticosteroid creams can treat skin rashes related to allergies. mmunotherapy is a long-term treatment option for chronic allergy symptoms. Anaphylaxis is a medical emergency, and people should call 911 if they suspect someone is having an anaphylactic reaction. Antihistamines can help to treat most minor allergic reactions regardless of the cause. These drugs reduce the body’s production of histamine, which reduces all symptoms, including sneezing, watering eyes, and skin reactions. Second-generation antihistamines, including Claritin (loratadine) and Zyrtec (cetirizine), are less likely to cause drowsiness than first-generation antihistamines, such as Benadryl. Antihistamines in these forms are available from pharmacies, to buy online, or on prescription from a doctor. Antihistamines can also be taken to prevent allergies. Many people with seasonal or pet allergies will begin taking antihistamines when they know they are going to be exposed to an allergen. A person who is pregnant or has a liver disorder should consult their doctor before taking antihistamines. Nasal decongestant pills, liquids, and sprays can also help reduce stuffy, swollen sinuses and related symptoms, such as a sore throat or coughing. However, decongestant medications should not be taken continuously for more than 72 hours. Nasal decongestants are available over the counter and online. Non-steroidal anti-inflammatory medications (NSAIDs) may also be used to help temporarily reduce pain, swelling, and cramping caused by allergies. The best way to treat and prevent allergic reactions is to know what triggers the reaction and stay away from it, especially food allergens. When this is not possible or realistic, using antihistamines or decongestants when in contact with allergens can help to treat the symptoms. A saline sinus rinse may treat symptoms such as a runny or itchy nose. When allergies cause sinus problems, the American Academy of Allergy, Asthma & Immunology (AAAAI) recommend a person rinse their sinuses with saline. This can remove allergens and clear the airways. Sinus rinsing devices can be purchased online or from a pharmacy. Topical corticosteroid creams or tablets. Corticosteroids contain steroids that reduce inflammation and itching. Mild forms of these creams can be found online, and a doctor can prescribe stronger versions. Moisturizing creams. Emollient creams with soothing ingredients, such as calamine can treat skin reactions. Bite or sting medication. Medication targeted to reduce allergic reactions to insect bites or stings have a similar effect to other allergy medications. Ice pack. Applying an ice pack wrapped in cloth to the area for 10- to 15-minute intervals can reduce inflammation. People should speak to a professional if they have or suspect that they have severe or chronic allergies. You are always more than welcome to call our clinic for more information. A doctor can prescribe medications that contain much stronger doses of the compounds found in OTC products. Immunotherapy, or allergy shots. Immunotherapy can be between 90 and 98 percent effective at reducing allergic reactions to insect stings, for instance. Prescription asthma medications, such as bronchodilators and inhaled corticosteroids. Oral cromolyn can be taken for food allergies. Drug desensitization therapy is used for specific allergens. Many traditional medicine systems use herbal supplements and extracts to both treat and prevent allergic reactions, especially seasonal allergies. Though there is little scientific evidence to support the use of most alternative or natural remedies, some people may find that some can provide relief from their symptoms. Dietary changes. A low-fat diet high in complex carbohydrates, such as beans, whole grains, and vegetables may reduce allergy reactions. Bioflavonoids. These plant-based chemicals found in citrus fruits and blackcurrants may act as natural antihistamines. These can also be taken as supplements. Supplements. Flaxseed oil, zinc, and vitamins A, C, and E are suggested to improve allergy symptoms. Acupuncture. Acupuncture treatments may help some people to find relief from their symptoms. The terms diastole and systole refer to when the heart muscles relax and contract. The balance between diastole and systole determines a person’s blood pressure. The heart is a pump that supplies all tissues and organs of the body with oxygen-rich blood. The heartbeat is caused by the heart muscles relaxing and contracting. During this cycle, the period of relaxation is called diastole and the period of contraction is called systole. What are diastole and systole? Diastole is when the heart muscle relaxes and systole is when the heart muscle contracts. Diastole is when the heart muscle relaxes. When the heart relaxes, the chambers of the heart fill with blood, and a person’s blood pressure decreases. Systole is when the heart muscle contracts. When the heart contracts, it pushes the blood out of the heart and into the large blood vessels of the circulatory system. From here, the blood goes to all of the organs and tissues of the body. During systole, a person’s blood pressure increases. The heart is a pump composed of four chambers. It is divided in the middle into a right and left side, and each side is divided further into two chambers — the upper and lower chambers. The two upper chambers of the heart called the atria receive the blood that is entering the heart. The two lower chambers are called the ventricles. They pump the blood out of the heart to the rest of the body. To pump the blood around the body, the heart contracts and then relaxes over and over again in a cycle called the cardiac cycle. The cycle begins when the two atria contract, which pushes blood into the ventricles. Then, the ventricles contract, which forces the blood out of the heart. The deoxygenated blood that comes back from the body to the right side of the heart is then pumped through the lungs where it picks up oxygen. The oxygenated blood then travels to the left side of the heart and is pumped to the rest of the body. When the heart pushes blood around the body during systole, the pressure placed on the vessels increases. This is called systolic pressure. When the heart relaxes between beats and refills with blood, the blood pressure drops. This is called diastolic pressure. Normal blood pressure will be under 120/80 mmHg. When a person receives their blood pressure results, they will see two numbers that represent the diastole and systole measurements. These measurements are given as millimeters of mercury (mm Hg). 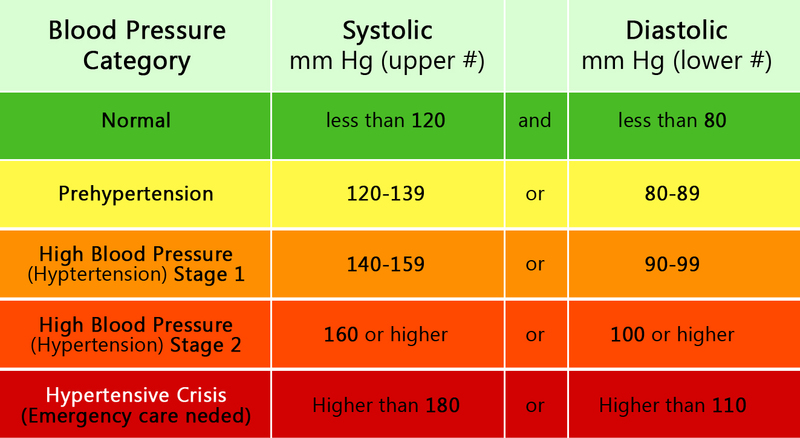 The first number is the systolic pressure and the second is the diastolic pressure. These updated guidelines are likely to place 46 percent of Americans in the category of having high blood pressure. Blood pressure is always measured when the person is at rest and over several days. Its measurements are also called blood pressure readings. Gender and age may increase a person’s risk of high blood pressure. High blood pressure or hypertension is when a person has abnormally high pressure against the walls of their blood vessels. This condition develops gradually over many years and may go unnoticed for a long time, as there are often no symptoms. Age. Blood pressure is usually higher with age. Gender. Men are more likely to have high blood pressure before the age of 55, but women are more likely than men to have the condition after the age of 55. Race. High blood pressure is more common in African Americans than Caucasian or Hispanic Americans. Family history. Having a family member with high blood pressure increases the risk of a person developing high blood pressure in the future. Obesity. A person who is overweight or obese is more likely to develop high blood pressure. This is because a higher volume of blood circulates through blood vessels to supply the cells with oxygen and nutrients. Because there is more blood circulating, there is a higher pressure on the vessel walls. Lifestyle habits. A lack of physical activity, smoking tobacco (including second-hand smoking), drinking too much alcohol, consuming too much salt (sodium) or too little potassium, and stress may increase the risk. Certain chronic conditions. Kidney disease, diabetes, and sleep apnea can increase the risk of high blood pressure. Pregnancy. In some cases, pregnancy can cause high blood pressure. Heart attack. A block in the flow of oxygen-rich blood to a portion of the heart, preventing that portion of the heart from getting oxygen. Stroke. A stroke happens when there is a block in the flow of oxygen-rich blood to the brain, preventing that portion of the brain from getting oxygen. Heart failure. Failure of the heart to pump enough blood to meet the body’s demands, caused by the increased pressure on the vessels. Peripheral artery disease. This is the narrowing of blood vessels other than those that supply the heart or the brain, most commonly of the legs. Blood flow to that part of the body is affected. Aneurysm. An aneurysm is the development of an abnormal bulge in a blood vessel wall, which may press on other organs, block blood flow, or eventually burst. Chronic kidney disease. Kidney disease can be caused by narrowing of blood vessels in the kidneys, which prevents them from working properly. Low blood pressure or hypotension occurs when a person has abnormally low blood pressure against the walls of their blood vessels. Age. People older than 65 are more likely to experience a drop in blood pressure while standing up, or after eating. Children and young people are more likely to experience a rapid drop in blood pressure accompanied by dizziness, blurred vision, and fainting, which is known as neurally mediated hypotension. Certain medications. High blood pressure medicines, including diuretics, can cause hypotension. Certain diseases. Conditions such as Parkinson’s, diabetes, and some heart conditions increase the risk of low blood pressure. Other factors. Pregnancy, standing in the heat, or standing still for long periods of time can also cause low blood pressure. A person with mild low blood pressure may experience fatigue, fainting, or dizziness. More severe forms of low blood pressure can compromise oxygen-rich blood flow to the body’s major organs, including the brain. If this happens, a person may feel sleepy, confused, or light-headed. In serious cases, this can evolve to heart or brain damage.